Ed Miliband’s choice of Alan Johnson as his Shadow Chancellor is, for all the obvious reasons, likely to define the opening period of his leadership. It has been welcomed in some quarters as evidence that he is very much his own man and is determined to maintain control of economic policy himself. Not for him, it is said, the establishment of a rival centre of power at the Treasury. But there is clearly a downside as well. It was clearly identified by Alan Johnson himself, in a way that drew attention not only to his lack of any knowledge of economics, but also must surely have raised questions about his political acumen. Ministers must have salivated at his admission that he would need to consult “a primer on economics”. The appointment raises further issues. The challenge for incoming ministers (and shadow ministers) is always to equip themselves with enough knowledge about their brief to allow them to make a proper assessment of the advice that is proffered by their expert advisers. Too often, ministers come into office armed only with a few simple slogans and find that within a short time they have been persuaded that they are not a satisfactory basis for policy. From then on, they are lost and become the prisoners of their advisers. widely accepted orthodoxy that need only be understood to be safely adopted, and even if there were, the recent history of such orthodoxy does not engender great confidence. An incoming Treasury minister (or shadow minister) will be entirely at the mercy of official advice unless he or she has enough expertise to be able to evaluate that advice. The appointment of Alan Johnson and the sidelining of those Shadow Cabinet members who have some real expertise in economic policy suggest strongly either that he is to be a mere cipher and Labour’s economic policy will be made elsewhere (and possibly by Ed Miliband himself), or that Labour is content to have its economic policy decided by officials. If that is the case, Ed Miliband’s Labour party will have failed to remedy one of New Labour’s central weaknesses. It was New Labour’s failure to question free-market orthodoxy that helped to usher in the recession and that ultimately did for them electorally. On surely the most important issue of the day, it is essential that Labour is able to mount an effective assault on the coalition government’s constant assertion that “there is no alternative” to deep and damaging cuts in public spending and to offer a coherent and persuasive alternative view. It will not be enough to rail against the damaging impact of the cuts; that impact will be obvious to everyone, but will be trumped as an argument by the contention that the deficit makes the cuts inevitable. What Ed Miliband’s Labour needs to do is not only attack the unfairness, harshness and ideological bias of the cuts. They must also argue that they are the wrong response in economic policy terms to the crisis – that giving priority to the government’s finances and to getting their deficit down in the short-term rather than restoring the health of the economy as a whole in the longer-term is to ensure that the recession is longer and deeper – and the deficit more persistent – than they need be. There is of course a perfectly legitimate economic policy argument to this effect. 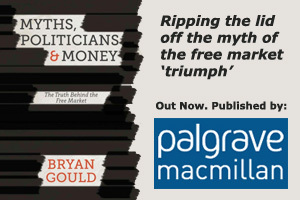 It is supported by a great deal of expert opinion around the world and by the lessons that should be drawn from what we know about what caused the recession.But already, the evidence is that the argument is being conceded. Nothing is more depressing about our economic plight than the success the Tories have had in establishing in the public mind that it was “Labour’s recession” and that they have been left to clear up the mess by imposing unavoidable cuts. To fail to engage the coalition government effectively on this issue is to concede a huge amount of political territory for no good reason. Sadly, the appointment of someone who, whatever his other strengths may be, has to be guided towards whatever current orthodoxy demands suggests that Labour will – at best – bide its time in responding to the central political issue it confronts. We may never know what passed between Standard and Poor’s and our Finance Minister on the eve of the budget. And only time will tell whether the “primary focus” of the budget was – as the Prime Minister claimed – the avoidance of a credit rating downgrade and whether, in the long run, that goal was achieved. But the episode does raise a number of interesting questions. Eyebrows were understandably raised at the explicit acknowledgment that the government’s budget strategy has been shaped by the need to please an overseas credit rating agency. How did we, as a sovereign country, become so powerless to decide our own destiny? We don’t have to look far for the answers. After decades of poor economic performance and – as a consequence – of living beyond our means, we are now one of the world’s most indebted countries. On some measures, only Iceland had a greater overseas debt in proportionate terms than we have – and we know what has happened to Iceland. The size of our debt means that we are dangerously dependent on the willingness of others to lend to us. In times of plentiful and relatively cheap credit, borrowing (at a price) was not a problem. But the global crisis has changed all that. Credit is now in short supply and countries like New Zealand, with substantial deficits to finance, will have to pay an interest rate premium to borrow – if they are able to borrow at all. The level of interest we must pay will depend crucially on our credit rating – and that is why the government is so concerned about the view taken of us by Standard and Poor’s. According to the Treasury, a downgrade would cost the country $600 million and interest rates could rise across the board by 1.5%. But is this all as stark as it seems? Are the threats of a credit downgrade and its consequences as serious as they sound, and – even if they were – would they be a price worth paying for gains that are even more important? We should note, first, that the Treasury and others have been very relaxed over a long period about interest rates that have been much higher and more damaging to our economy than anything currently contemplated. And we should also note that many of the more frightening Treasury forecasts of the likely level of government debt seem to be simple extrapolations of the short-term and recession-induced deterioration in the government’s financial position, and to pay little attention to the beneficial impact of an effective counter-recessionary strategy. And no one – least of all Standard and Poor’s – could overlook the fact that our government’s financial position is, by both our own historical standards and in terms of international comparisons, reassuringly strong. Let us assume, in other words, that the credit rating agencies are not lacking in intelligence and know their own business. The government may be obsessed by the projected level of government debt but Standard and Poor’s know that the government’s relatively healthy debt position is only a small part of the real problem – the huge amounts that we as a country (and that includes all of us, banks, businesses, individuals as well as the government) have to borrow overseas if we are to keep our heads above water. That is the real issue of credit-worthiness – not the government’s debt but the country’s indebtedness. That can be corrected only if we reverse the long-term failure of economic policy and performance and it will only get worse if we fail to use the spending power of government to rescue us from recession. That, surely, is what a credit rating agency should be focusing on. The best and quickest way, after all, of bringing both the government’s debt and the country’s borrowing requirement down to manageable levels is to make the recession as short and as shallow as possible. The buoyant tax revenues produced by a recovering economy will quickly bring the deficit down, and repay the $600 million supposed cost of a credit downgrade (if it should happen) several times over. Just how rapidly that can happen can be seen from how fast the government’s finances travelled in the opposite direction once the recession struck. No one would welcome a credit downgrade. No one can cavil at the government’s insistence on value for money in public spending. But our over-riding goal should surely be recovery from recession. In giving priority to a temporary increase in government debt as we face the worst recession in generations, we may be taking our eye off the ball. There is a bigger game in town, and that is the health of the economy as a whole. This revised version of an earlier piece was published in the New Zealand Herald on 1 June. As the participants prepare for the “jobs summit” this week, they will be hoping for a strong lead from Treasury and the Reserve Bank as to the way ahead. But, on the evidence so far, our policy-makers are floundering. After trying and failing to use monetary policy to grapple with our own home-grown recession throughout 2008, they now have to meet the new challenge of a world that has changed dramatically and to do so with a monetary policy instrument that now seems even less relevant. What, after all, is now the goal of monetary policy? For decades, we have been told that inflation is all that matters and monetary policy all that is needed to deal with it. Now that inflation is the least of our worries, and the limitations of monetary policy are evident, a significant change in mindset and a new range of policy instruments are surely needed. We should in any case temper any sympathy we might feel for our policy-makers with the thought that it is their mistakes that created many of our problems in the first place. Our 2008 recession – well-entrenched by the beginning of 2008 – was the end result of decades of ideologically-driven policy errors that had eventually run us into the buffers. Those mistakes had seen the average New Zealand family end up $80,000 a year worse off than their Australian counterparts, and even that disastrous performance was achieved at the expense of massive overseas borrowings, a huge trade deficit, and the fire sale of many of our national assets. It is from this unfortunate starting-point that we now have to face the threat of world recession. The measures put in place just to deal with our own recession were hardly adequate for the task, but they certainly need reinforcing now if we are to ward off the worst effects of the global downturn as well. That is not to say that the steps that have been taken are not welcome, as far as they go. The cuts in interest rates may be far too late but are better late than never. Tax cuts will also help but fall far short of what is needed and, according to most observers, are less effective than public spending in stimulating economic activity. The promise of a rolling programme of public investment in infrastructure is certainly welcome, though it seems to be proceeding on a somewhat leisurely, drip-feed timetable and to be just tracking along in the wake of a crisis that is relentlessly gathering pace. Worryingly, there seems to be more concern in some quarters about allowing the government deficit to grow than with the increased and substantial fiscal stimulus the economy now needs. But that is to put ideology ahead of practicality. The whole point of the last decade of reducing government debt was surely to equip us to use public spending to stimulate the economy when it proved necessary. The prudence of past governments has meant that, in that respect, we are better placed than most to use government spending to help counteract recession – and that, rather than the size of the government’s deficit, is surely our top current priority. We are of course constantly assured by Treasury that the size of the fiscal stimulus already delivered to the economy is very large by international standards. But that assertion was made last year, before the crisis truly hit and before other countries had made responses that dwarf ours by comparison. The stimulus so far provided (including tax cuts and spending yet to materialise) is estimated to equate to 2.8% of GDP. But in the US and the UK (where huge sums have also been spent on bailing out the banks), packages the equivalent of several multiples of our own have been put in place, and our response is of course also much smaller than the fiscal stimulus announced by the Rudd government in Australia. These countries have, in other words, done much more than we have, from a starting-point that was much less difficult; they were not already in recession, as we were, when the global downturn struck. It is time to forsake ideological purity (for whatever that is worth) and focus on what pragmatically needs to be done. On top of our domestic woes, we now need to address a desperate international situation that is unprecedented in most people’s lifetimes. If jobs and businesses are to be saved, we will need more than occasional, case-by-case interventions. We must recognise that, if bank lending and credit creation are falling back, the case for the government to fill the gap with programmed credit for investment is overwhelming. The Prime Minister, at least, seems aware that more needs to be done, and that spending on infrastructure is the way to go. We must hope that this week’s summit – and his own advisers – will agree with him.